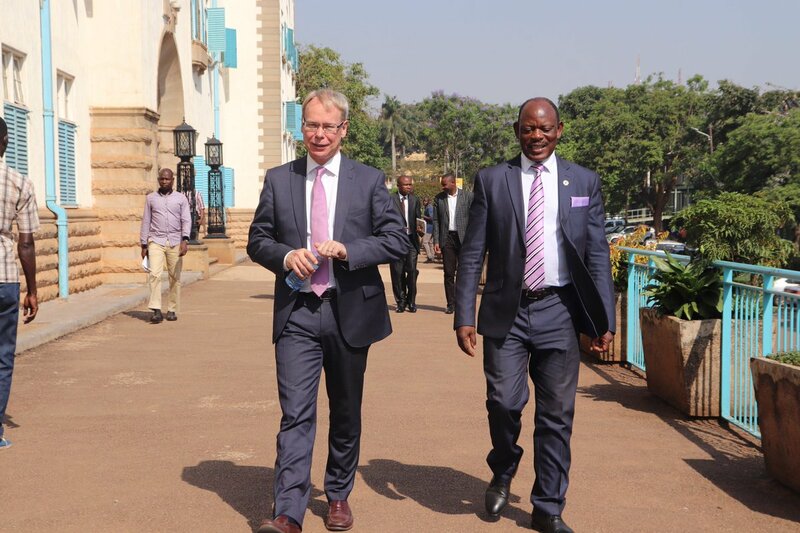 MAKERERE – Makerere University Vice-Chancellor Prof. Barnabas Nawangwe late this week hosted a high-level delegation from the Embassy of Sweden, Kampala, Uganda. The Swedish was led by the Ambassador H.E. Per Lindgärde. The cordial meeting was attended by the Acting Deputy Vice Chancellor in charge of Academic Affairs (DVCAA), Prof. David Kabasa, Acting Deputy Vice-Chancellor in charge of Finance and Administration (DVCFA), Prof. Eria Hisali and Dr. Gity Behravan, First Secretary Research Cooperation at Embassy of Sweden. It is standard procedure for the Embassy to conduct routine analysis of the research cooperation in relation to its effectiveness, efficiency, relevance, sustainability and impact of the programme. 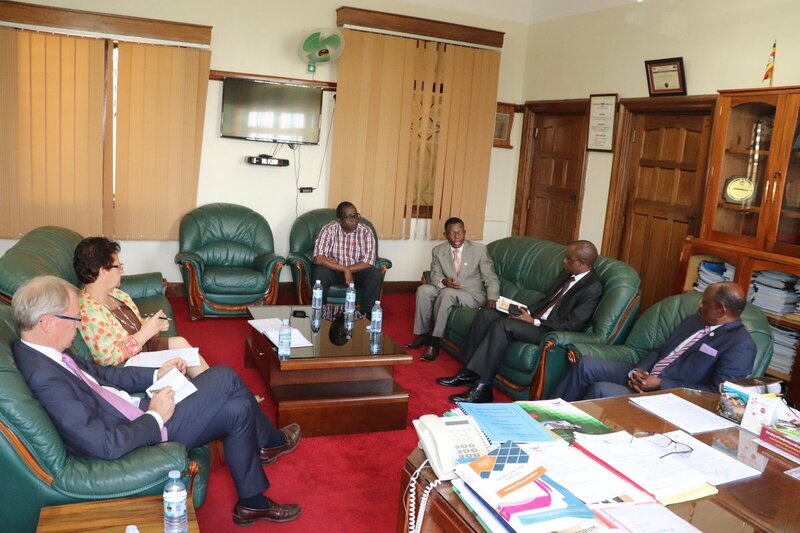 At this time, the Embassy is interested in open, constructive engagement with Makerere University in order to jointly explore plans that will sustain what has been achieved, and evaluate strategies to ensure enhanced Government funding as well as methods to continue successful partnerships beyond 2020 when the Sida funding comes to an end. “I have had a wonderful meeting with H.E Per Lindgarde Ambassador of Sweden in Uganda and Gity Behravan scientific officer about collaboration between Makerere and Sweden in research. We have discussed issues of research impact and sustainability. Thank you Ambassador Lindgarde,” Prof Nawangwe tweeted after the meeting. The meeting reflected on Makerere’s level of institutional preparedness, capacity in terms of resources, mechanisms, policies, and structures to continue implementing the research programme activities beyond 2020. In an effort to improve the scale, productivity and quality of research at the graduate level and more specifically for doctoral programs, the Directorate of Research and Graduate Training (DRGT) is promoting the approach of collaborative graduate training as a means of sharing capacity and experiences. Makerere is increasingly promoting and encouraging the creation of collaborative doctoral programs in a number of fields. For instance, through the Swedish Embassy, 11 Swedish Universities partnered with five public universities in Uganda to collaborate on a research program. The current effort builds on the successful completion of other collaborations between Makerere University and Swedish Universities since 2000 when such initiatives were first conceived and implemented. Professor Buyinza Mukadasi, the Makerere Director, DRGT, said the university needs to embark on a stakeholder consultative process with the aim of establishing mechanisms to fund research programme activities beyond 2020. In this regard, he adds that DRGT will identify Champions to initiate sustainability strategies, and discuss the findings at the Annual Research Planning Conference in April 2019.